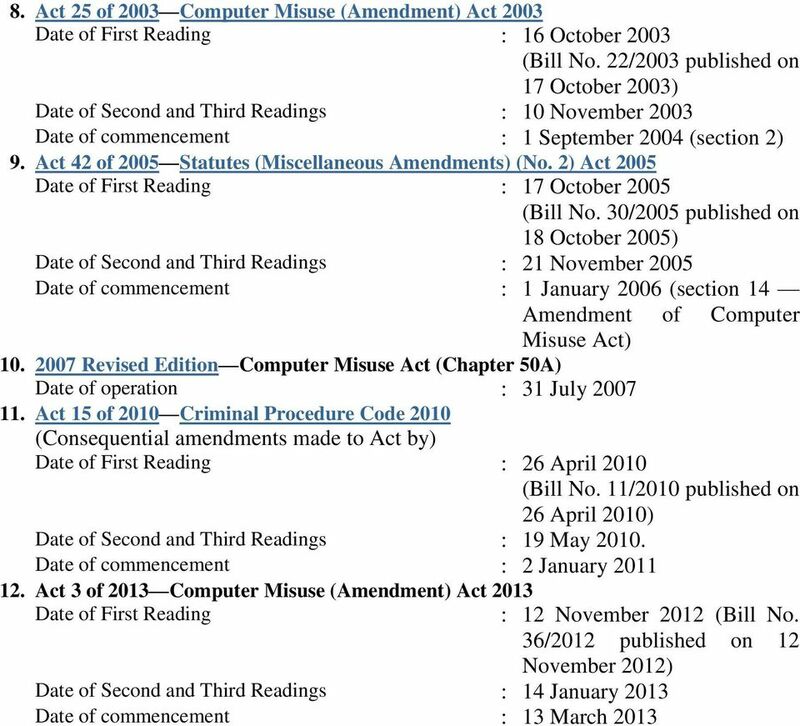 Download "COMPUTER MISUSE AND CYBERSECURITY ACT (CHAPTER 50A)"
5 Unauthorised modification of computer material 5. 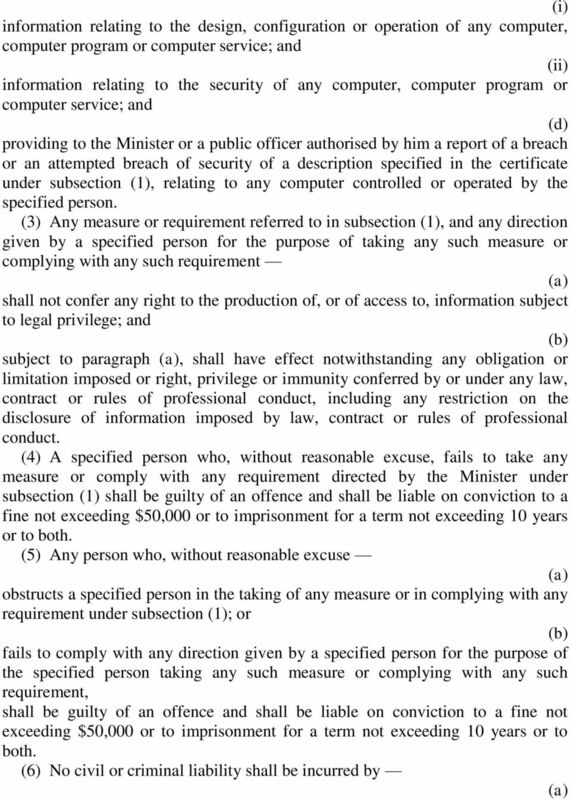 (1) Subject to subsection (2), any person who does any act which he knows will cause an unauthorised modification of the contents of any computer shall be guilty of an offence and shall be liable on conviction to a fine not exceeding $10,000 or to imprisonment for a term not exceeding 3 years or to both and, in the case of a second or subsequent conviction, to a fine not exceeding $20,000 or to imprisonment for a term not exceeding 5 years or to both. (2) If any damage is caused as a result of an offence under this section, a person convicted of the offence shall be liable to a fine not exceeding $50,000 or to imprisonment for a term not exceeding 7 years or to both. 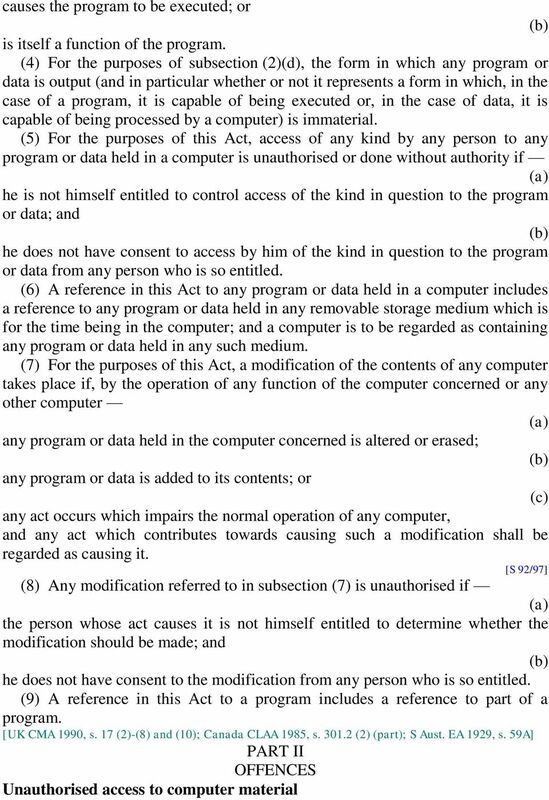 (3) For the purposes of this section, it is immaterial that the act in question is not directed at any particular program or data; a program or data of any kind; or a program or data held in any particular computer. (4) For the purposes of this section, it is immaterial whether an unauthorised modification is, or is intended to be, permanent or merely temporary. 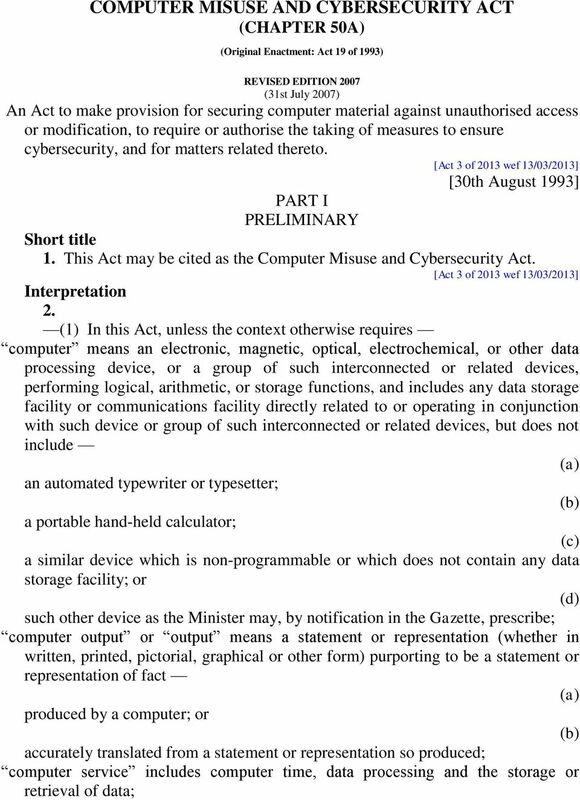 [UK CMA 1990, s. 3] Unauthorised use or interception of computer service 6. 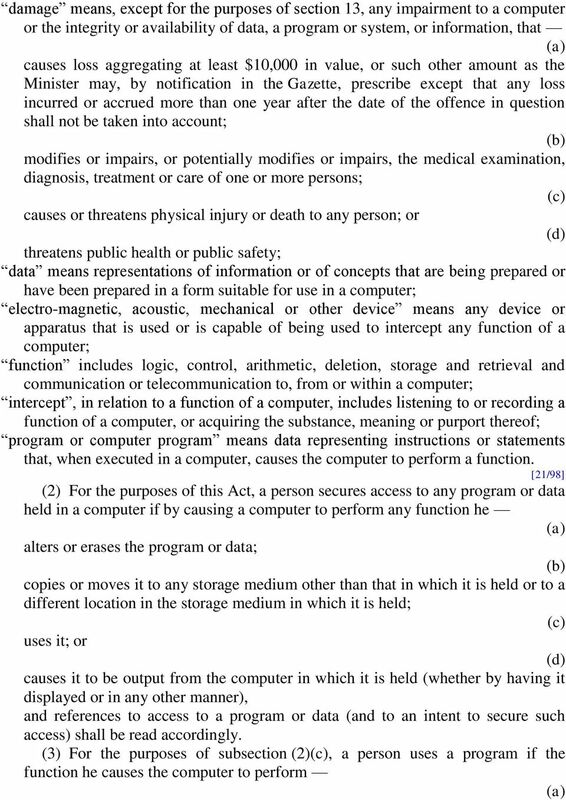 (1) Subject to subsection (2), any person who knowingly secures access without authority to any computer for the purpose of obtaining, directly or indirectly, any computer service; intercepts or causes to be intercepted without authority, directly or indirectly, any function of a computer by means of an electro-magnetic, acoustic, mechanical or other device; or uses or causes to be used, directly or indirectly, the computer or any other device for the purpose of committing an offence under paragraph or, shall be guilty of an offence and shall be liable on conviction to a fine not exceeding $10,000 or to imprisonment for a term not exceeding 3 years or to both and, in the case of a second or subsequent conviction, to a fine not exceeding $20,000 or to imprisonment for a term not exceeding 5 years or to both. 7 exceeding 3 years or to both and, in the case of a second or subsequent conviction, to a fine not exceeding $20,000 or to imprisonment for a term not exceeding 5 years or to both. 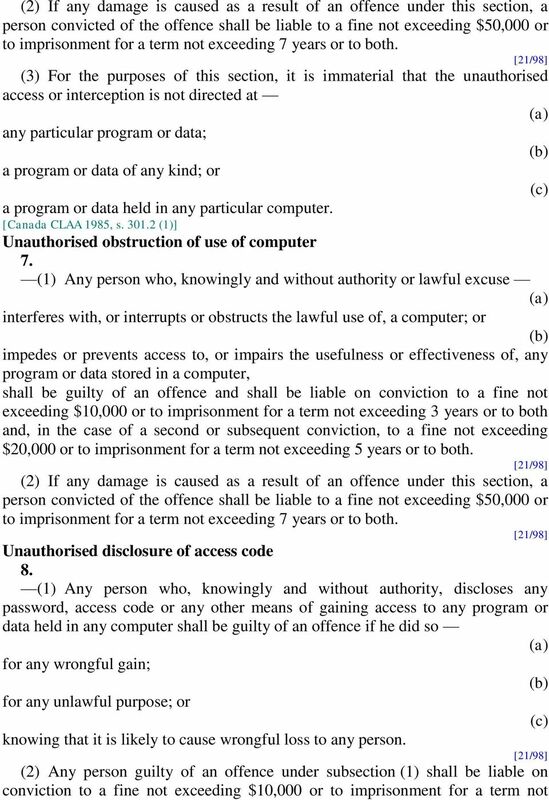 Enhanced punishment for offences involving protected computers 9. 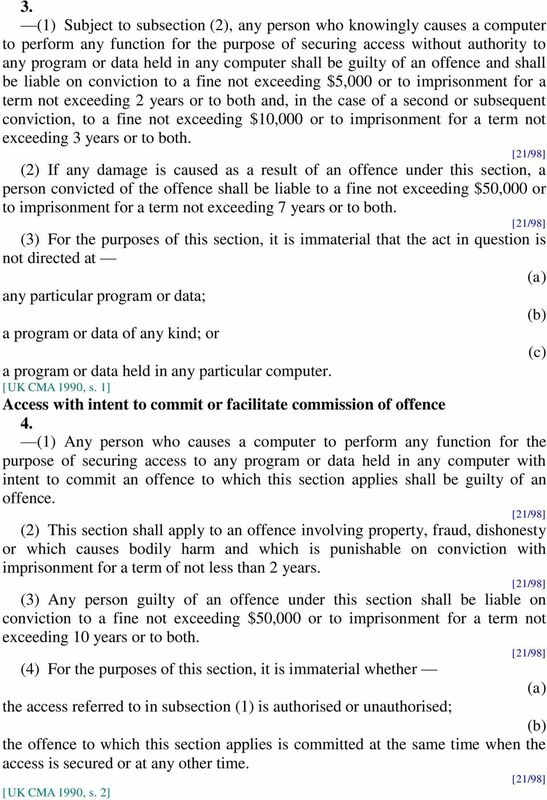 (1) Where access to any protected computer is obtained in the course of the commission of an offence under section 3, 5, 6 or 7, the person convicted of such an offence shall, in lieu of the punishment prescribed in those sections, be liable to a fine not exceeding $100,000 or to imprisonment for a term not exceeding 20 years or to both. 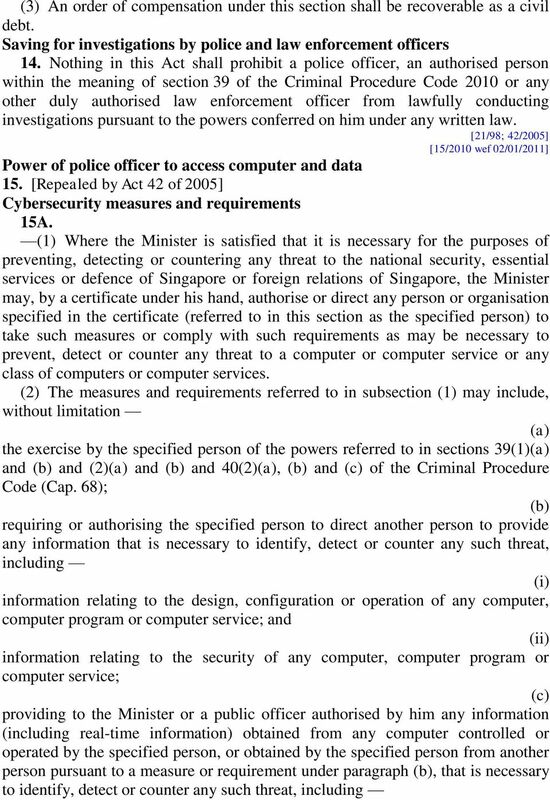 (2) For the purposes of subsection (1), a computer shall be treated as a protected computer if the person committing the offence knew, or ought reasonably to have known, that the computer or program or data is used directly in connection with or necessary for the security, defence or international relations of Singapore; the existence or identity of a confidential source of information relating to the enforcement of a criminal law; the provision of services directly related to communications infrastructure, banking and financial services, public utilities, public transportation or public key infrastructure; or (d) the protection of public safety including systems related to essential emergency services such as police, civil defence and medical services. 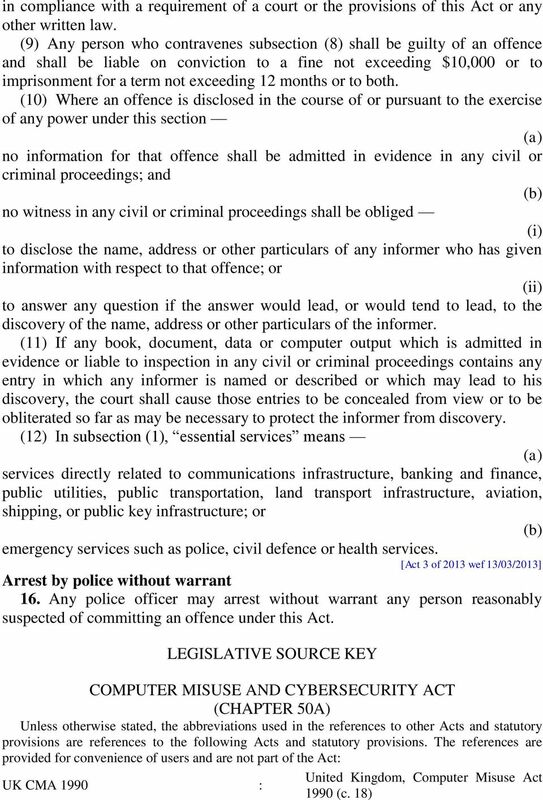 (3) For the purposes of any prosecution under this section, it shall be presumed, until the contrary is proved, that the accused has the requisite knowledge referred to in subsection (2) if there is, in respect of the computer, program or data, an electronic or other warning exhibited to the accused stating that unauthorised access to that computer, program or data attracts an enhanced penalty under this section. Abetments and attempts punishable as offences 10. (1) Any person who abets the commission of or who attempts to commit or does any act preparatory to or in furtherance of the commission of any offence under this Act shall be guilty of that offence and shall be liable on conviction to the punishment provided for the offence. 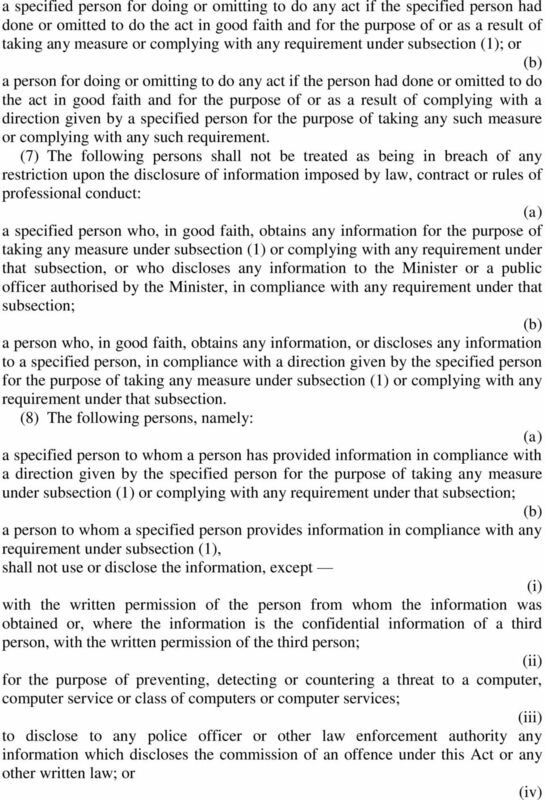 (2) For an offence to be committed under this section, it is immaterial where the act in question took place. 8 PART III MISCELLANEOUS AND GENERAL Territorial scope of offences under this Act 11. (1) Subject to subsection (2), the provisions of this Act shall have effect, in relation to any person, whatever his nationality or citizenship, outside as well as within Singapore. 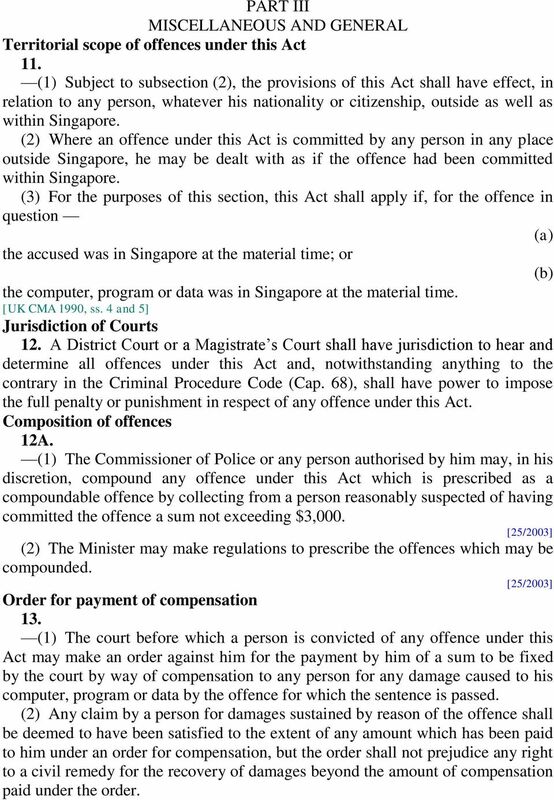 (2) Where an offence under this Act is committed by any person in any place outside Singapore, he may be dealt with as if the offence had been committed within Singapore. 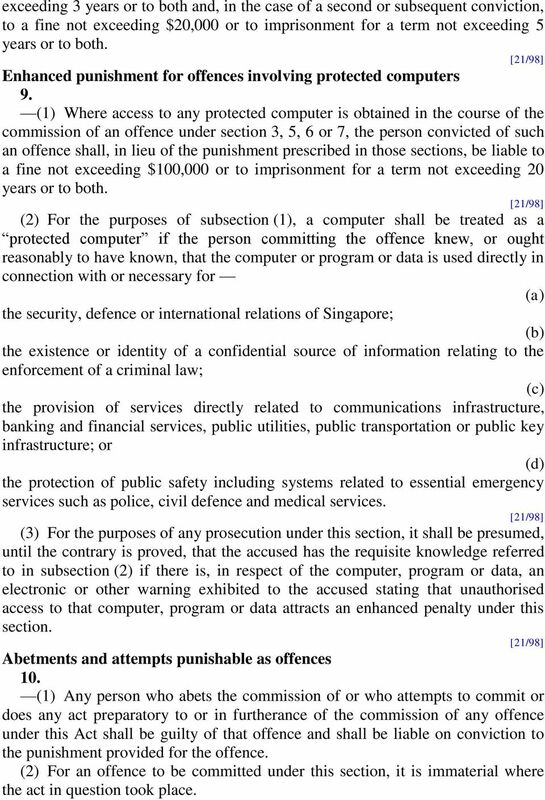 (3) For the purposes of this section, this Act shall apply if, for the offence in question the accused was in Singapore at the material time; or the computer, program or data was in Singapore at the material time. [UK CMA 1990, ss. 4 and 5] Jurisdiction of Courts 12. A District Court or a Magistrate s Court shall have jurisdiction to hear and determine all offences under this Act and, notwithstanding anything to the contrary in the Criminal Procedure Code (Cap. 68), shall have power to impose the full penalty or punishment in respect of any offence under this Act. Composition of offences 12A. (1) The Commissioner of Police or any person authorised by him may, in his discretion, compound any offence under this Act which is prescribed as a compoundable offence by collecting from a person reasonably suspected of having committed the offence a sum not exceeding $3,000. [25/2003] (2) The Minister may make regulations to prescribe the offences which may be compounded. [25/2003] Order for payment of compensation 13. (1) The court before which a person is convicted of any offence under this Act may make an order against him for the payment by him of a sum to be fixed by the court by way of compensation to any person for any damage caused to his computer, program or data by the offence for which the sentence is passed. (2) Any claim by a person for damages sustained by reason of the offence shall be deemed to have been satisfied to the extent of any amount which has been paid to him under an order for compensation, but the order shall not prejudice any right to a civil remedy for the recovery of damages beyond the amount of compensation paid under the order. 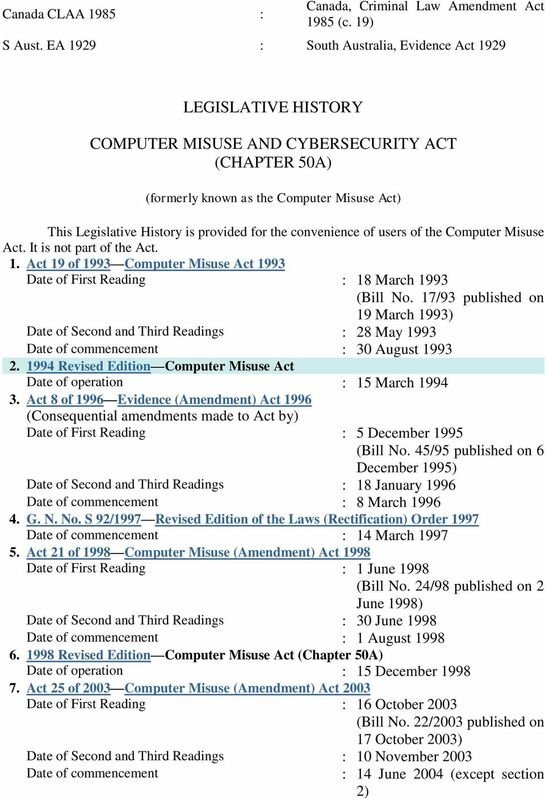 Computer Crimes Act 1997. 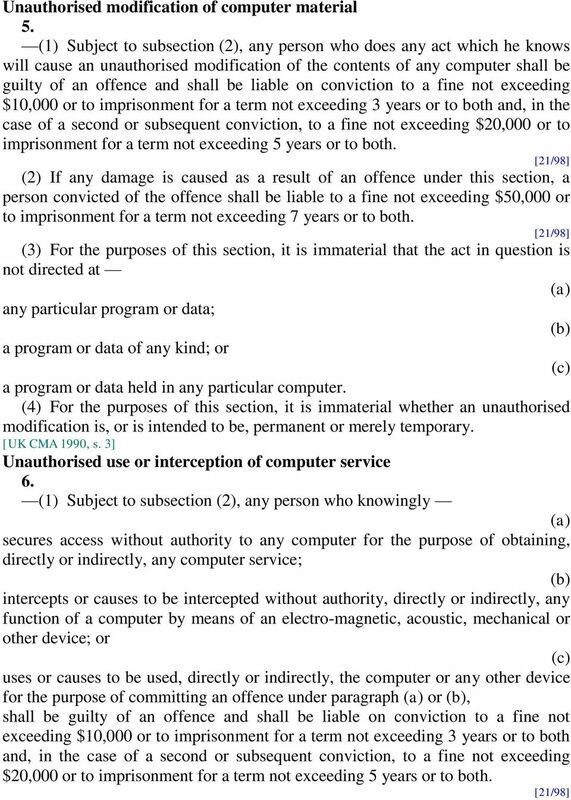 An Act to provide for offences relating to the misuse of computers. CRIMINAL LAW ACT CHAPTER 10:04 Acts 20 of 1936 45 of 1979 Amended by 36 of 1985 16 of 1997 *90 of 2000 *See Note on page 2 Current Authorised Pages Pages Authorised (inclusive) by L.R.O. 1 10.. L.R.O. STATUTORY INSTRUMENTS. S.I. No. 336 of 2011 EUROPEAN COMMUNITIES (ELECTRONIC COMMUNICATIONS NETWORKS AND SERVICES) (PRIVACY AND ELECTRONIC COMMUNICATIONS) REGULATIONS 2011 (Prn. A11/1165) 2  S.I. 4. Laying of orders and regulations before Houses of Oireachtas. AN BILLE UM CHIONTÓIRÍ A ATHSHLÁNÚ 2007 REHABILITATION OF OFFENDERS BILL 2007 Section 1. Interpretation. Mar a tionscnaíodh As initiated ARRANGEMENT OF SECTIONS 2. Application to have sentence spent. 3. Ordinances Nos. 9 of 1930, 29 of 1930, 55 of 1943. CHAPTER 55 AN ORDINANCE FOR THE TAXING OF, FOR THE REGISTRATION OF RACE-COURSES, AND FOR EXEMPTING TAXABLE BETS FROM THE PROVISIONS OF THE GAMING'ORDINANCE. Act 6 Whistleblowers Protection Act 2010 THE WHISTLEBLOWERS PROTECTION ACT, 2010. Supplement No. 2 published with Extraordinary Gazette No. 90 dated 31 st October, 2011.